The biggest giver I know made her transition a week ago Sunday. She was my mother. By the time you’re reading this I’ll be or have attended her funeral. I’m quite sure your mother was an example of the Givers described in Give and Take. She was probably a self-less giver or an otherish giver, or more likely a combination of both. Selfless Givers is a person with high other interest and low self-interest. They give their time and energy without regard for their own needs, and as a result pay a price for it. Give and Take describes selfless giving as a form of pathological altruism, defined by researcher Barbara Oakley as, “unhealthy focus on others to the detriment of one’s own needs.” In the process trying to help others, givers end up harming themselves. Successful givers are Otherish: they care about benefiting others, but they also have ambitious goals for advancing their own interests. Selfless giving, in the absence of self-preservation instincts becomes overwhelming. Otherish giving means being willing to give more than you receive, but still keeps your own interests in sight, using them as a guide for choosing when, where, how and whom to give. Arguably mothers are otherish givers. If not they would burnout. I believe as “Cathy” Cartoonist Cathy Guisewite wrote, "All parents believe their children can do the impossible. They thought it the minute we were born, and no matter how hard we've tried to prove them wrong, they all think it about us now. And the really annoying thing is, they're probably right"
Thus I believe our parents, particularly my mother, had ambitious goals for me the moment I was born. I’m betting your mother had ambitious goals for you too! When a family member dies the question is whether you have regrets. I feel strongly that I have no regrets. 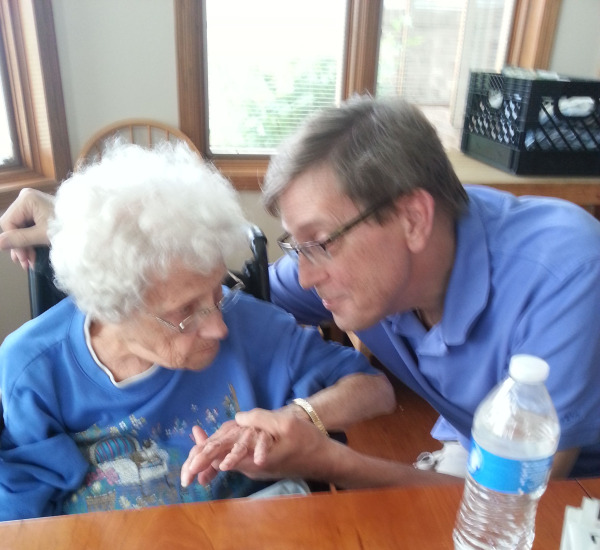 I was fortunate to have spent a few hours the day before she died at the hospice with her. My mother loved flowers. The hospice was naturally surrounded by flowers, a pond, trees and shrubs. On the day she checked in, she was lucent enough to proudly announce to Carmen, my nephew’s wife and caretaker, the name of each flower as they toured the grounds. I’m disappointed that my mother didn’t have more time to spend with my current family, Michelle, Noah and Joshua. In my previous marriage and through my divorce my mother was able to spend much more time with my son Daniel. Part of this was due to living in Wisconsin, closer to my mother, and due to the time my brother Gary would spend with me and helping with Dan. As I got married and had a family, Gary’s health deteriorated. My mother spent almost all her time dedicated to him, making sure he was getting proper treatment and caring for him. She already had another son, Jim, my oldest brother who after becoming quadriplegic in a drag racing accident in 1973, she dedicated one day a week to helping. I could regret the time she didn’t get to spend with my family, however my mother was doing exactly what a mother does, taking care and loving her children, who were desperately in need. Being the baby of the family my two older brothers always felt I was favored. Perhaps that was true. If it is true I got the front end of the deal with my mother’s attention. As a young boy growing up I always knew my mother loved and cared and wanted the best for me. My mother used to always tell me when I came home from school, “Get your school work done and then you can have the rest of the evening to yourself.” I followed her instructions, my brother Gary, not so much. I believe it gave me a sense of urgency that I still honor to this day. My mother also revealed to me a comment my first grade teacher told her at her parent-teacher conference, “Doug loves a challenge!” It’s inspired me through many challenges and obstacles. Impatience is possibly another trait I inherited from my mother. Carmen, who took care of my mom after her hip broke several years ago, remarked that when my mother wanted something done, she wanted it done now. Growing up when she asked Gary and I to do chores, she expected them done immediately. If we didn’t there was always the threat of a strapping, the instrument of discipline when I grew up. Perhaps my impatience today is from the demands my mother placed on me, and my desire now to see things done quickly. Who do you know that has given you more than your mother? Perhaps you have someone who did. In my case no one has been more kind, generous, caring, loving, demanding and expectant than my mother. My wife Michelle carries on that tradition in my family. She is the biggest giver I know. There were times I’m sure my mother felt burned out. Mothers by their nature are selfless givers too often. I sincerely hope you all have had the benefit of having a giver like my mother in your life.